Ellen G. White: Was she a Plagiarist? Was Ellen White inspired by God when she wrote her books, or was she just a literary pirate? Probably the most popular of the allegations against Ellen White was a plagiarist--that she deviously copied from other writers without their permission, then claiming that the material was her own. In the items below you will be able to analyze in detail some of the leading claims of critics and come to your own conclusion. The careful investigator will also want to review the copyright laws as they existed in Ellen White's day compared with today. Borrowing from Conybeare and Howson(?) Back in 1919, Dudley Canright charged that Ellen White had plagiarized her 1883 book, Sketches from the Life of Paul, from a book by two British authors. He went so far as to claim that the authors had even threatened a lawsuit. Was there any truth in all of this? In this series of pages we examine the comparisons between the two books provided for us by critic Sydney Cleveland. 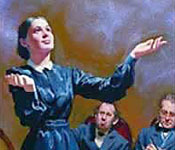 Ellen White Copied from Edersheim . . . or Was It Vice Versa? Ellen White has been accused of copying chapter titles for Patriarchs and Prophets from books by Alfred Edersheim. Yet since those same titles are found in books Ellen White wrote 12 years before Edersheim wrote his, one is left to wonder if this case of plagiarism might be the other way around. Take a look and see what you think. "Mrs. White's Health Visions: From God? Or Dr. Jackson?" Some claim that Ellen White got her health reform material from Dr. James C. Jackson instead of from vision. We examine the evidence here, and while we had difficulty confirming the claim, we did uncover a case of plagiarism of another sort. Mrs. White wrote Steps to Christ Critics charge that Fannie Bolton wrote Steps to Christ, "plagiarizing" from other Christian writers in the process. Using the information the critics themselves provide, discover for yourself the truth behind this one. See if you end up as surprised as we were.